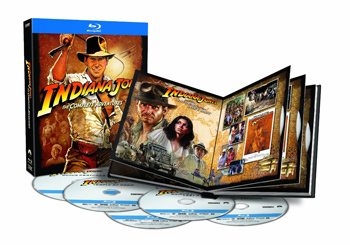 At last we have all the Indiana Jones movies on Blu-ray. 2008’s Kingdom of the Crystal Skull went Blu back in the year of its release, but this set – called “The Complete Adventures” – marks the Blu-ray debut of the original films from the 1980s. For full information on the individual movies, please consult my separate reviews of 1981’s Raiders of the Lost Ark, 1984’s Indiana Jones and the Temple of Doom, 1989’s Indiana Jones and the Last Crusade and 2008’s Indiana Jones and the Kingdom of the Crystal Skull via the links above. Please note that the picture and sound grades found at the top of this article represent an average for the four movies. Though this article covers the boxed set as a whole - which is currently the only way to purchase the first three movies – here I want to concentrate mainly on the package’s fifth disc. Called simply “Bonus Material”, this disc includes a wealth of Indy information. Not found with prior DVDs, On Set with Raiders of the Lost Ark goes for 57 minutes, 53 seconds and offers comments from director Steven Spielberg, executive producer/story creator George Lucas, associate producer Robert Watts, producer Frank Marshall, production designer Norman Reynolds, and actors Harrison Ford, Paul Freeman, Ronald Lacey and Karen Allen. Those remarks constitute a small portion of “Set”, as most of the time it remains true to its title and lets us play “fly on the wall” during the shoot. That framework succeeds in spades. We get a great view of the production via all the rehearsal material and also find copious outtakes and deleted scenes. (In a nice touch, the 1.33:1 image expands to 2.35:1 for those elements.) From start to finish, “On Set” is a total delight. Under Making the Films, five programs appear. A vintage Making of Raiders of the Lost Ark comes from 1981 and runs 57 minutes, 48 seconds. It offers notes from Spielberg, Lucas, Marshall, Ford, Allen, Watts, Reynolds, stunt coordinator Glenn Randall, 2nd unit director Mickey Moore, stuntman Terry Leonard, and director of photography Douglas Slocombe. “Making” acts like an extension of “On Set”, as both share similar formats. The majority of “Making” sticks to the Raiders set and other places like the studio in which sets were built. Indeed, you’ll see some of the same moments and sound bites in both shows. Of the two, “On Set” works better, partly because it includes so many outtakes and deleted scenes. Nonetheless, “Making” is quite good on its own. I could watch hours of footage from the set; I just don’t get tired of this material, so another documentary of this sort is fine with me. “Making” adds a lot of value to the package. We then find four contemporary documentaries. 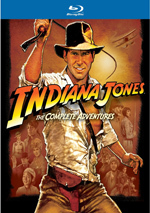 The first three come from the 2003 DVD set: The Making of Raiders of the Lost Ark (50:52), The Making of Indiana Jones and the Temple of Doom (41:09) and The Making of Indiana Jones and the Last Crusade (35:03). We get modern-day remarks from executive producer/story creator George Lucas, director Steven Spielberg, screenwriters Lawrence Kasdan (Raiders), Willard Huyck and Gloria Katz (Temple), actors Harrison Ford, Alfred Molina, Paul Freeman, Karen Allen, John Rhys-Davies, Kate Capshaw, Ke Huy Quan, Roshan Seth, Sean Connery, Julian Glover, and Alison Doody, production designer Norman Reynolds, costume designers Deborah Nadoolman (Raiders) and Anthony Powell (Temple and Crusade), producer Frank Marshall, director of photography Douglas Slocombe, associate producer (Raiders)/producer (Temple) Robert Watts, associate to Spielberg (Raiders)/associate producer (Temple)/production executive (Crusade) Kathleen Kennedy, second unit director Michael Moore, editor Michael Kahn, and mechanical effects supervisor (Temple and Crusade) George Gibbs. In addition to these modern interviews, we get on-the-set comments from Raiders mechanical effects supervisor Kit West and Crusade actors River Phoenix and Denholm Elliott. Each segment covers its film fairly well. Of course, the Raiders component offers the most information, partially because it involves the highest amount of backstory as we learn about the film’s origins, development of the story and Spielberg’s involvement in it, getting a studio to back it, and casting. From there it examines the flick on a semi-scene-by-scene basis. Essentially it goes through each major sequence and elaborates on different components like stunts, effects, location challenges, and various experiences on the set. Both the Temple and Crusade programs work the same way, though they lack the equivalent level of depth. Overall, these shows fare nicely, as they remain consistently entertaining and informative. Ford is something of a disappointment, as he doesn’t tell us much about his work, but others make up for his blandness. On the other hand, Capshaw seems especially delightful as she goes through her travails on the set of Temple; her story about how she got through the bug sequence is particularly amusing. Not surprisingly, the surplus of archival materials adds a lot to the documentaries. The best elements come from the many behind the scenes shots. We watch them put together a lot of moments, and we also find funny bits like one in which Spielberg chews out a snake who doesn’t act appropriately slithery. And yes, we do find a little of Tom Selleck’s screentest; he performs along with Sean Young. We also see Karen Allen’s audition with Tim Matheson. Both clips are very short, but at least they’re here. (Additional screentests for Capshaw and Quan show up in the discussion of Temple.) Ultimately, I liked these three documentaries. For something more modern, we go to the 28-minute, 49-second The Making of Indiana Jones and the Kingdom of the Crystal Skull. It features Spielberg, Ford, Allen, screenwriter David Koepp, producers Kathleen Kennedy and Frank Marshall, director of photography Janusz Kaminski, stunt coordinator Gary Powell, production designer Guy Hendrix Dyas, special effects coordinator Dan Sudick, animal handler Jules Sylvester, 1st AD Adam Somner, costume designers Mary Zophres and Bernie Pollack, and actors Ray Winstone, Cate Blanchett, and Shia LaBeouf. This one looks at the relaunch of the series, story/character elements, cast and performances, sets and locations, stunts and action, production design and effects, and a few other filmmaking topics. An abbreviation of a piece from the original 2008 DVD/BD, this “Making” provides a good look at the production. We get a nice mix of topics and learn a fair amount from it. That said, I have no idea why it pares down the 2008 documentary so severely; that one ran more than 50 minutes longer. The remaining materials show up under the Behind the Scenes domain. We start with The Stunts of Indiana Jones, a 10-minute and 56-second exploration of that topic. All of the four featurettes use the same format as “Trilogy”. Here we get interviews with Lucas, Spielberg, Ford, and stuntmen Vic Armstrong and Terry Leonard. They go through the making of some big sequences. Raiders receives the greatest emphasis via scenes like Indy on the Nazi truck. I’m not sure why these elements didn’t just show up in the documentaries, as they would have fit snugly there. In any case, “Stunts” provides a fairly concise look at some of the movies’ material. We get some introductory notes from Spielberg at the top of The Sound of Indiana Jones, but the 13-minute and 21-second program mostly concentrates on the work of sound designer Ben Burtt. He delves into various special elements of the trilogy and how he created the noises used for those pieces. From Indy’s whip to guns to snakes to rats to pretty much everything else, Burtt takes us on an efficient and interesting tour of his inventions. A similarly focused piece shows up via The Music of Indiana Jones. In this 12-minute and 22-second program, we get a few remarks from Lucas and Spielberg, but composer John Williams dominates. He discusses some of the movie’s themes and the challenges he confronted in this music-heavy trilogy. The show’s a little general, but it’s mostly informative. For the final featurette, we get the 12-minute and 22-second The Light and Magic of Indiana Jones. This presents interviews from Lucas, Spielberg, Frank Marshall, Raiders visual effects supervisor Richard Edlund, Temple visual effects supervisor Dennis Muren, Temple and chief visual effects cameraman/Crusade visual effects supervisor Michael J. McAlister. They go over the creation of a few key sequences from each movie. We learn about segments such as the effects of the Ark at the end of Raiders, the mine car chase in Temple, and the invisible bridge in Crusade. As with “Stunts”, the various pieces of “Light” probably should have been integrated into the documentaries, but it’s nonetheless a good exploration of how the effects folks brought some tricky bits to life. The Melting Face! lasts eight minutes, 12 seconds and includes Spielberg, special make-up effects artist Chris Walas, and visual effects supervisor Richard Edlund. We learn how they melted Toht’s face and see a demonstration of the effect. This proves to be an informative – if disgusting – discussion. In the 11-minute and 46-second The Creepy Crawlies, we hear from Spielberg, executive producer Frank Marshall, animal wrangler Jules Sylvester, and actors Harrison Ford and Karen Allen. "Crawlies" looks at the Indy series’ use of unsettling critters like snakes, insects and rats. We learn a lot about how movies feature these creatures as well as their specific "performances" in the films. It becomes a surprisingly informative piece. Next comes Travel With Indy: Locations. The nine-minute and 58-second show includes Ford, Marshall, Allen, and producer Robert Watts. As you probably guessed, "Travel" looks at the locations and sets used for the different Indy films. We get more informative material in this compelling program. Both "Crawlies" and "Locations" can be viewed with or without Pop-Up Trivia. That option gives us some additional factoids about the subject matter. This feature works pretty well, as the "Trivia" offers some useful tidbits. For a look at some romantic interests, we head to the nine-minute and 15-second Indy’s Women: The American Film Institute Tribute. It includes comments from actors Karen Allen, Kate Capshaw and Alison Doody as they discuss their characters and performances. Their remarks are pretty good to hear, though I wish we got more of them than just this excerpt. I also would’ve liked more interaction among them; they sit together in a panel, so it would’ve been nice to hear them chat together about their experiences. Still, their notes are enjoyable. After this we find Indy’s Friends and Enemies. The 10-minute and 10-second piece features Lucas, Spielberg, Raiders screenwriter Lawrence Kasdan, Temple screenwriters Willard Huyck and Gloria Katz, and executive producer Frank Marshall. They discuss the series’ support characters. I like the notes, though the first half goes over Indy’s romantic interests; why not put that material in “Women” and devote more time here to the sidekicks and villains? Also, it’s too bad none of the actors appear here, as it’d be nice to hear a little from them. It’s a nice piece, though, despite these drawbacks. Iconic Props goes for nine minutes, 52 seconds and features Spielberg and property master Doug Harlocker. The shows concentrates on elements unique to Skull but also tells us a little about returning pieces like Indy’s whip. Harlocker gives us a nice tour of these items and lets us get a good look at them. Next comes the 22-minute and 34-second The Effects of Indy. It provides info from Spielberg, Lucas, ILM digital artist Paul Huston, ILM animation supervisor Steve Rawlins, ILM digital model supervisor Dave Fogler, ILM view paint supervisor Steve Walton, ILM digital compositing supervisors Sean MacKenzie and Jay Cooper, visual effects supervisor/aerial unit/unit director Pablo Helman, ILM digital matte supervisor Richard Bluff, Kerner Optical model supervisor Brian Gernand, ILM lead TD supervisor Craig Hammack, ILM associate visual effects supervisor Marshall Krasser, ILM digital production supervisor Jeff White, ILM creature and simulations supervisor Eric Wong, Kerner Optical lead model maker Nicholas A. D’Abo, and ILM visual effects art director Christian Alzmann. While the prior programs included some notes about practical effects, this show looks exclusively at CG elements, models and miniatures. Though a bit dry at times, “Effects” covers its topics well and turns into another valuable show. After this we get Adventures in Post-Production. The 12-minute and 36-second piece involves Spielberg, Marshall, Kennedy, editor Michael Kahn, sound designer/supervising film editor Ben Burtt, re-recording mixer/additional sound design Christopher Scarabosio, and composer John Williams, We go over editing, sound design, and music. Don’t expect much about the editing, as the featurette barely discusses that topic. However, we get very good notes about the audio, and Williams includes some nice thoughts about his score. Those aspects of the piece make it worthwhile. Do we lose anything from the prior releases of these films? Yup – quite a lot, in fact. Everything from the 2003 set’s bonus disc reappears here, but components found on the 2008 DVDs go absent. As I already mentioned, the Blu-ray greatly abbreviates the Crystal Skull documentary, and it axes a few other featurettes for that film. Most of the 2008 Special Edition DVDs’ featurettes pop up here, but we lose galleries and storyboard elements. All of these prevent “Indiana Jones: The Complete Adventures” from becoming the definitive release of these films. On its own, however, I find “The Complete Adventures” to be a solid set. All four movies look and sound great, and we get a slew of useful supplements. While I feel disappointed that the package loses so many pre-existing bonus materials, that shouldn’t be enough to dissuade any purchasers. This remains a fine representation of a delightful film series.